Baking gives a convincing result and is simpler than deep-frying. Think of these as crumble and custard in doughnut form. 2. Mix the sugar, flours, ground cinnamon and salt together in a large bowl, then make a well in the centre and add the yeast. Test the milk temperature with your little finger – it should be warm but not hot. Pour the milk mixture into the well and leave to stand for 5 minutes to let the yeast dissolve. Add the beaten eggs, then mix with a wooden spoon to a smooth, very wet dough (almost a batter); set aside for 10 minutes. 5. Shape the risen and kneaded dough into 16 balls and place, well spaced out, on well-floured baking sheets. Cover loosely with oiled cling film and leave to prove in a warm place until almost doubled in size – about 45 minutes-1 hour. 6. Meanwhile, make the custard. Bring the milk to just before boiling in a pan. Whisk the egg yolks, sugar and vanilla in a large bowl, then whisk in the flours. Gradually pour in the hot milk, whisking as you go. Pour the custard back into the pan, bring back to the boil and whisk constantly for about 2 minutes, until smooth and thick (it will seem lumpy at first but will become smooth again). Transfer to a bowl and cover the surface directly with cling film to prevent a skin forming. Leave to cool and chill completely. 7. For the apple compote, put the apples, sugar and 2 tbsp water in a pan. Bring to a simmer, then cover and cook for 10 minutes, stirring halfway. Stir to a mashed consistency, then set aside to cool. 8. Preheat the oven to 190˚C, gas mark 5. Remove the cling film and bake the doughnuts for 8-12 minutes, until they are dark golden and sound hollow when tapped on the bottom. Cool briefly on the tray. 5 For the coating, mix the caster sugar and cinnamon together in a shallow container. Brush each warm doughnut with melted butter, sit it in the sugar and sprinkle all over to coat. Repeat until all are coated, then leave to cool. 9. To finish the custard, use electric beaters to beat the cream in a bowl until thick but not stiff. Beat the cold custard until smooth, then fold in the whipped cream. 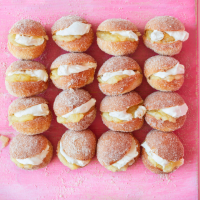 Split the doughnuts in half, then fill each one with a spoonful each of custard and compote.